This Troodon has a double edged dagger blade that is two-tone finished stainless steel with plain edges. 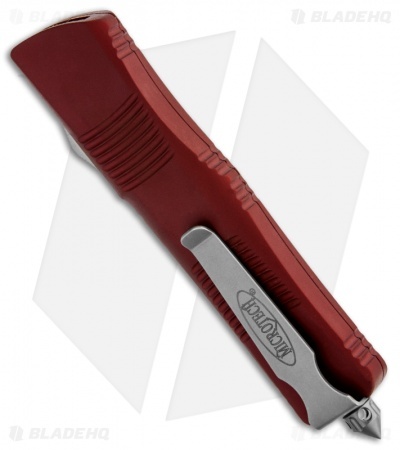 The handle is red anodized 6061-T6 aluminum with grooves for added grip-ability. 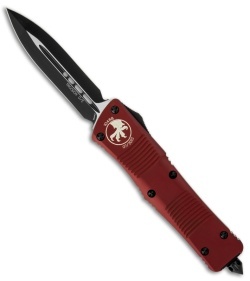 The knife includes a black finished pocket clip, glass breaker and hardware. The Troodon dinosaur was a smart, stealthy predator in its day, and the word is Greek for "wounding tooth.” Microtech's Troodon out-the-front automatic knife is a worthy bearer of the name in both design and function.